The Canon EOS 1000D followed the company’s slightly-better-specified EOS 450D, aiming to bring the DSLR concept in a non-intimidating form. The 100D features a CMOS-type sensor with an effective resolution of 10.1MP, with Canon’s EOS Integrated Cleaning System included to help minimise dust incursion. The EOS 1000D has a DIGIC III processor to handle all processing and operating functions, and allows images to be captured in both JPEG and Raw modes, as well as a simultaneous capture of the two. Bundled with the 1000D is the Canon EF-S 18-55mm IS kit lens, which, as the ‘IS’ moniker suggests, comes with image stabilisation to provide up to four extra stops than would be possible without. The EOS 1000D has a focusing system that offers a seven-point wide-area pattern, which is fairly comprehensive for an entry level model’s stature. At its centre is a cross type point, with a working aperture of f/2.8, with the remaining six points arranged in a diamond formation. Both auto and manual focusing may be called upon when in live view mode, which displays a feed of the scene via the 2.5in LCD screen on the camera’s rear. Options within live view shooting include a depth of field preview function, a magnification of up to 10x, and a grid overlay. As with its older 450D sibling, we see the same 35-zone metering pattern with options for evaluative, centre-weighted and partial metering, though there’s no spot option. Exposure compensation for both ambient and flash exposures may be selected over a range of -/+2EV, with the standard PASM exposure modes joined by an Auto option, an assortment of Scene presets, and Canon’s long-standing A-DEP option. 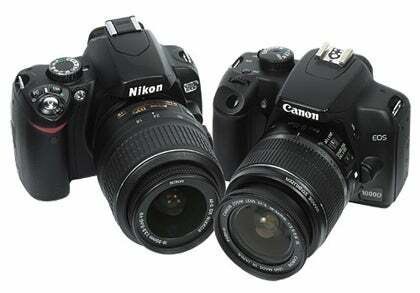 The Nikon D60 takes the opposite route top the Canon 1000D by growing out of its D40x predecessor. Its form is virtually identical, as is the 10.2MP resolution, which gives it marginal (if negligible) edge in terms of resolution output over the EOS 1000D. Images are also stored in a choice of Raw and JPEG formats, though only a basic level JPEG may be recorded at the same time as a Raw file. Without its own autofocus motor the D60 can only autofocus with motorised lenses, such as those in Nikon’s AF-S and Sigma’s HSM ranges. The latter, together with Tamron, has also been active in providing motorised versions of their current models, which, with Nikon’s AF-S ranges make enough models to satisfy pretty much every lens choice. Processing comes courtesy of Nikon’s familiar Expeed technologies, though a feature unique to the D60 is its dust-removal system. The D60 has an Airflow Control system, constructed in such a way so that the action of the mirror physically pushes dust down into its own collection chamber at the base of the camera, where it collects on an adhesive strip. This is paired with the more standard dust-removing method of sensor-based vibration, which is activated on shutdown of the camera, or manually as required. Focusing with the Nikon D60 is limited to a trio of horizontally arranged points, with the options of Auto area, Dynamic, and closest subject. There’s no live view either, though the camera’s Stop Motion movie mode allows for a sequence of images to be compiled into an AVI file, producing a flickbook-style movie. The Canon 1000D has a body akin to a simplified 450D. The newer EOS 1000D model loses the rubber grip and thumb rest of the 450D, resulting in a model that’s almost entirely of the same matt finish, though the grip is a slightly textured plastic. The casing of the flash flows smoothly with the top-plate, while all buttons are large and clearly labelled. It’s also nice to see that Canon has retained a separate button for adjusting sensitivity on the top plate. The rear sports a 2.5in LCD screen as well as a standard directional menu pad, with most buttons dual functional, while the mode dial is sufficiently tall to provide easy use. As I noted in my original review, the lack of contouring and a proper grip results in a slightly featureless body that’s perfectly comfortable to hold but not quite as ergonomically complete as other models, such as the D60. Nikon’s more chiselled model varies little from its younger brothers, and at first glance you’d be hard pushed to tell the difference. The only changes are with the eye-piece sensor under the viewfinder, and a direct button for Active D-Lighting underneath the shutter release button. Its body is slightly mottled in finish, with fewer buttons than the 1000D and therefore fewer functions that can be directly accessed. The rear, for instance, offers just six buttons, a menu pad and a command dial, with plenty of room left over for comfortable handling. Indeed, one of the D60’s finest qualities is how well it feels in the hand.